This post is a guest post by Dr. Tim Elmore, founder of Growing Leaders. Tim is a leading authority on how to understand the next generation and prepare tomorrow’s leaders today. He is a best-selling author and international speaker, who helps develop emerging leaders under the philosophy that each child is born with leadership qualities. Teachers are unsung heroes. Teachers spend themselves emotionally and often are not remunerated adequately. So, I am voicing my appreciation to them in a different sort of way. It may just sound like a word of caution. May I take a moment and remind you of the number one occupational hazard for teachers, both in K-12 and in higher education? Imagine a baker, serving up cinnamon rolls, pastries, doughnuts, cakes and pies—but he does it so long and so hard that he wears himself thin. He is skinny as a rail and exhausted from never stopping to eat. In fact, he is a starving baker. He is so busy baking confections for others, he neglects to stop to eat, and he starves himself. This is an image illustrating what almost every teacher experiences at some point. Teachers can lose themselves in service to others, and fail to care for themselves. Sometimes, it’s easy to feel selfish when we push pause and actually relax, or read a book for refreshment, or somehow nourish our minds. But we must. We all recognize this truth: we’ll not be able to help anyone next to us if we don’t first ensure we’ve got oxygen ourselves. Bingo. What I am suggesting teachers do is not selfish at all; in fact, it may be the most selfless act you can practice. We are so much more valuable to others when we enter our day full and nourished, mentally, emotionally, physically and spiritually. I believe we must feed ourselves before we feed anyone else. 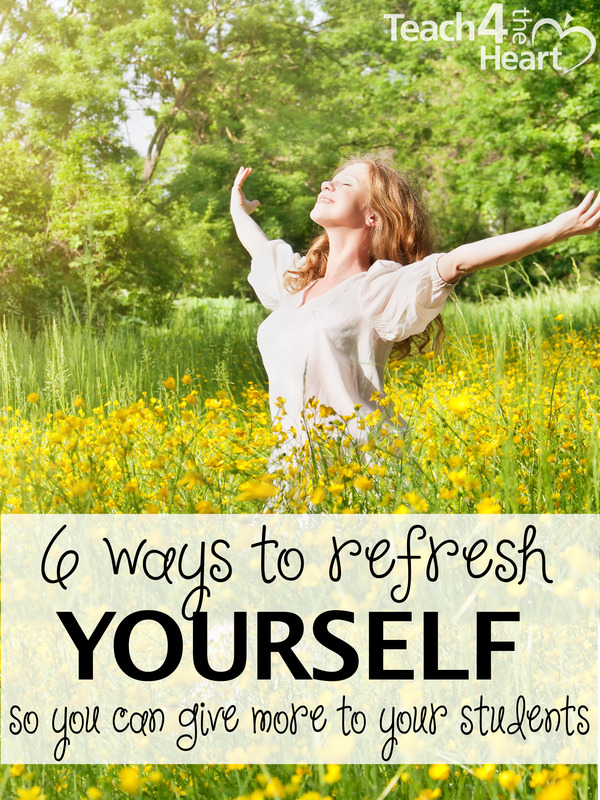 I’d like to suggest six ways you can refresh yourself as a teacher or leader. In fact, if you’re feeling like a “starving baker” I’d start right away. If you’re an administrator, find ways to make room for your faculty to practice these ideas. If you’re a parent, why not express gratitude for your kids’ teachers by sharing this list with them. Here’s a question for you: When was last time you did something for the first time? Too often we slip into ruts and call them grooves. Our habits require no thinking. 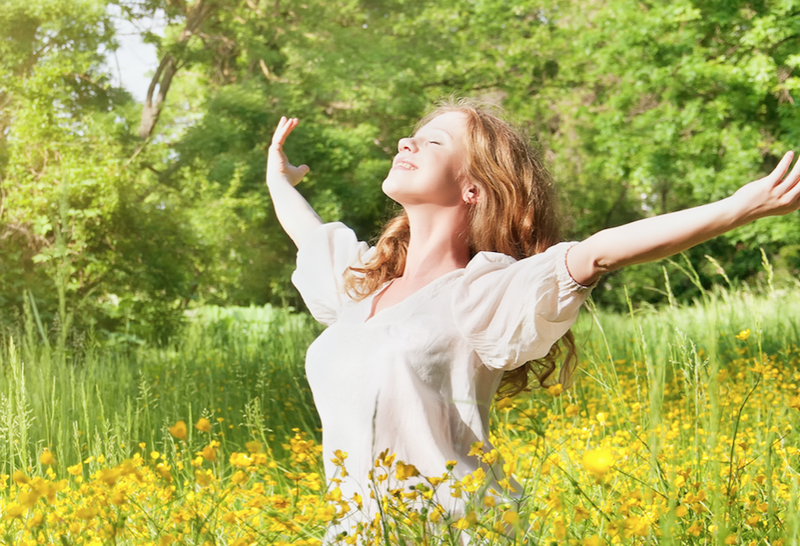 Over the next 90 days, try something brand new to clear the cobwebs from your brain. Why not check something off your “bucket list” with a new outdoor venture? Do something rejuvenating and fun. I have such a warped work ethic, that sometimes I feel guilty just doing something fun. It’s wrong. Research has shown that both kids and adults perform better when their day or week is broken up with engaging activities that participants call “fun.” Identify an activity you’d love to do, but feel you’re too old or too _______. Then, do it. Do something that stretches your thinking. This one works almost every time. Read a book or several magazines that normally you’d not consume. See what it does to your thought patterns. Winston Churchill said, “Change is as good as rest.” Just digesting new content or material can put a skip in your step. Jot down what you read or listen to—then add action steps. Do something with people who fill your tank. Wise educators and leaders know that just as a car runs on gasoline, they run on the emotional fuel of intentional relationships they’ve invited into their life. Why not choose a few people who ignite or refuel you intellectually or emotionally and get coffee with them. Find people who make you laugh or think or wonder. Do something in a new place (location). You likely know already—travel is an education in itself. I took my kids on trips all over the nation and the world as early as five years old. Guess what? I benefited from them as much as they did. Seeing a new culture, new landscape, new people and languages can shake us up in a marvelous way. Why not choose a place to go? Do an event that will ignite your mind and heart. One way I feed myself every year is to choose events or conferences that I know will fill me up. I know I’ll learn new ideas, gain creative practices and network with like-minded and brilliant people there. Thank you, Tim, for sharing these words of wisdom with us. If you’ve found yourself running on empty too often, I’d add one more piece of advice: Check out Angela Watson’s 40 Hour Teacher Workweek Club. This amazing program is helping overwhelmed teachers be more efficient, get more done in less time, and finally find the balance that leaves them happy and efficient both at home and at school. Click here for more information about the 40 Hour Teacher Workweek Club. Thank you for this article. I am going to go out now and do something fun! I love the 40 hour club!!! Thanks, Linda 🙂 Great suggestions. My husband and I love doing weekend getaways and hanging it out with lovely people! Strangely enough, blogging about teaching also brings refreshment! Helps to have a caring school community too.